Here are my top blog posts of 2017, meaning these are the articles that received the most clicks. I wrote an article this week on the need to put abstract theology to death, or at least dial it back quite a bit. Take a peek if you can. I received some pushback on the article, both here at the blog and on Facebook. And I welcome the pushback. It helps refine my own thoughts. My wife studied art at university. She knows a bit about abstract art. I know very little. However, I did find this definition concerning abstract art floating around the web waves. In its purest form in Western art, an abstract art is one without a recognizable subject, one which doesn’t relate to anything external or try to “look like” something. As I understand it, when something is abstract it is ethereal. It kind of floats out there in space, in air, but it doesn’t really relate to any concrete reality. I suppose you might say it is thought in it’s purest form. Keeping those ideas as ethereal ideas, but never making them real and tangible in life, to humanity. And, you know what? That’s how theology works so much of the time. It’s abstract, ethereal, non-tangible, a kind of heavenly, Casper-the-friendly-ghost ruminating about God and faith. We talk a good game, create great conceptual ideas about God and Christ and the Spirit and salvation and redemption and the church and so much more. All one has to do is crack open a 1000-page systematic theology textbook as an example. But they all end up being abstract, heady, and irrelevant to human life on planet earth. 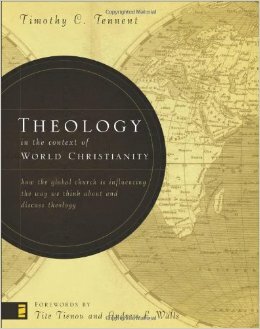 I’m currently reading a book entitled, Theology in the Context of World Christianity: How the Global Church Is Influencing the Way We Think about and Discuss Theology. To some, it might sound bland. However, for me, it is a topic of utmost import within discussion of theology and church.